The Dallas Mavericks' Dirk Nowitzki (left) shoots as the Minnesota Timberwolves' Kevin Love defends in the first quarter. 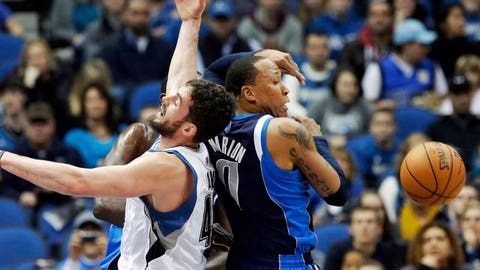 MINNEAPOLIS (AP) — Shawn Marion was getting to the rim at will, knocking down 3-pointers and playing tough defense. "I’m the type of person that if you see a foul, an obvious foul, you call it," Love said. "And I thought that was pretty, pretty obvious. . . . You look at the replay and it was obvious he got arm." Notes: Brandan Wright had 14 points off the bench for Dallas. . . . Injured Wolves Fs Chase Budinger (knee) and Ronny Turiaf (elbow) played 3-on-3 at the morning shootaround. There is still no timetable for their return. . . . Rubio picked up his 1,000th career assist in the first quarter.